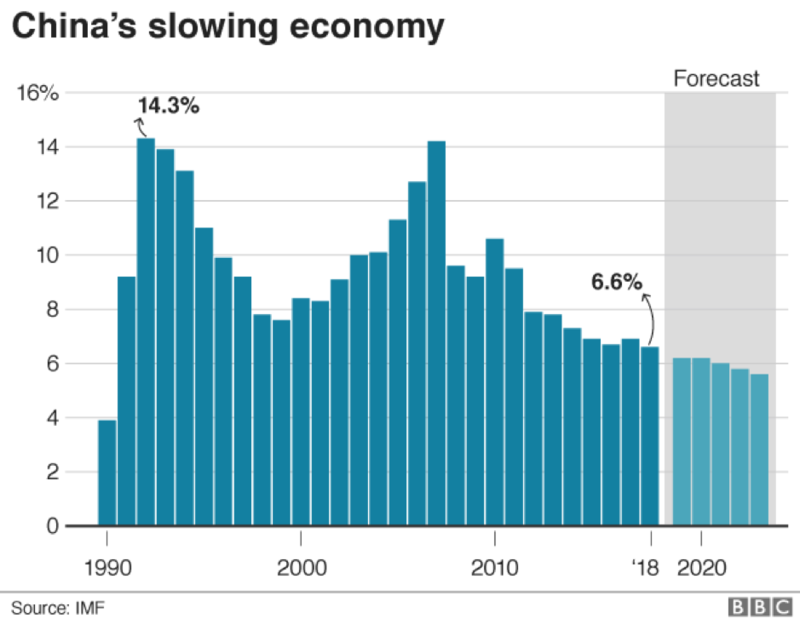 China’s economic growth of 6.5% in the past quarter was the weakest since the financial crisis and is expected to slow further. How are emerging domestic and global trends affecting China’s economic outlook? Did you know: China’s GDP growth is slowing from 6.6% last year to a projected 6.3% this year. Background reading: Is a US – China power transition inevitable? Welcome to our session on China’s Economic Outlook. and hosted by Yang Yanqing, Deputy Editor-in-Chief, YICAI Media Group. Are the panel worried about slowing growth in China? Jin Keyu says there is some confusion about why China is slowing down. She says it is a result of concerted government action to deleverage. As a result, she says it is slower but safer. Timothy Adams says the question is does the overlay of trade tensions with the US exacerbate the decline? Glenn Youngkin says today China is much more consumption driven. The consumer is nervous. When you take an environment where you have trade disputes and a deleveraging and a consumer that drives the economy, it’s not surprising that when the consumer gets nervous the economy slows down. Fang Xinghai says yes China’s economy has some short term challenges, but on a medium to long term basis, 3-5 years, the Chinese economy should continue to be a huge growth engine for the world. The chair asks the US panellists, as American investors is a trade deal possible? Youngkin says both sides are not going to violently agree. The heat will be turned up to the point that both sides recognize they need an agreement. We believe the reasons for making a deal will be compelling to both sides. Adams says we could have had a deal 18 months ago. US is happy to sell you soya beans. There are the outlines for a deal. What do you do about structural change, and the tech transfer, there is a way to solve that in the short term. John Zhao says nobody wins in a trade war. Now we are at the point that the harm is surfacing and people start to reflect how we got here. We’re at a point where we either advance this or we go backwards and create big time losers. Once we recognize the problem and the severity of that we can move forward. This is not just about the trading balance. He says, we’re at an age where globalization is getting to 4.0 supported by digital technology. We have some work to do. Sure we will work through these structural issues. Jin Keyu says two facts are enlightening. When tarrifs on Chinese imports increase for the US, Chinese firms stop importing. What is happening is that it is affecting the global supply chain. We are seeing big zeros in the data. Second she says US exports do not decrease in the same way. It’s not clear who is hurt more. Adams says protectionism doesn’t show up in the data. Youngkin says the longer this goes, the more permanent changes are made in the supply chain. Supply chains are complicated, you have to make 5 and 10 year commitments. This is exactly the risk which he is hoping is part of the heat that gets turned up. There needs to be an agreement. John Zhao says before the trade war there was constant optimization of the supply chain. China has started to move some manufacturing capacity to lower-cost areas such as Vietnam. There was gradual optimization. The trade war is causing reactive, unplanned activity. The harm of that is showing now. We have suppliers to the US moving a lot of their production to Vietnam, only to realize there is not enough skilled labour etc. It is going to show up in consumers’ costs, he says. Phones will cost more. We are going through the second phase of the cycle. He hopes that will increase pressure on politicians. Fang Xinghai says he thinks there will be a deal because President Trump measures his success by the Dow Jones. Stock prices fall as a result of the trade war. He says China is slowing down because of consumption, exports etc. but China has enough policy tools to cushion this slowdown. “I don’t worry about the short-term prospect of China’s economy.” China has policy tools to generate growth in the short term. The question is does China stop reform and the answer is no. Yesterday China approved a plan to launch a new science and technology board on the Shanghai Stock Exchange. That will allow tech firms to be financed by equity capital, rather than debt. He says you will see a boom of tech companies in the coming years. He says it will allow a much earlier public listing by the tech companies in the Chinese stock market. At this point any company in China that wants to list needs 3 years consecutive profit. It has to reach certain amounts. That prevented a lot of tech companies from getting listed and financed. John Zhao says this reflects many years of preparation. China didn’t know what stock was before 1992. This is very significant for us, for companies and underwriters carry the responsibility of truthful disclosure, removing the burden from the government. It’s a reform and I think that’s an ongoing process. Jin Keyu says there is excessive focus on debt levels and slowing growth. She says one of the key challenges for the Chinese economy, how do you allow resources to flow to the more productive areas of the economy. She says productivity growth has been very slow because of the misallocation of resources. Adams says the flow has to go to productive enterprises. So far we’ve seen flow to state owned enterprises (SOEs). Youngkin says if there are not good things to invest in we’re not going to invest. Capital finds good places to go. It just has to be allowed to go there. John Zhao says China has the world’s largest middle income group. The foreign capital started to notice the potential slowdown in the US. Capital is shifting, but more importantly China has a lot of capital. There are quite a lot of things to be hopeful about. Yang Yanqing says efficiency is an issue. Declining output from the input is an issue. Fang Xinghai says if you observe Chinese history of economic reforms, when growth slows, reform speeds up. Jin Keyu says the US pressure on trade helps that process. Fang Xinghai says he doesn’t want to say that. Jin Keyu asks is a disentanglement (of US and China) really possible? That is a question to reckon with, she says. John Zhao says one interesting thing that happened in the last period is that Tesla opened its largest factory in Shanghai. 100% owned. I didn’t hear anyone talk about forced tech transfer or anything like that. Here we talk about sustainability, how to be responsible for sustainability. China is leading in many areas. To do this they are setting policy frontiers which is guiding all participants to advance quicker. Yang Yanqing says the reform of the WTO relates to China’s reform. She asks the panellists to talk about the WTO. Jin Keyu says things have changed a lot. China is opening up its financial services so they are going to be importing a lot more of these services. For the first time in decades it has recorded its first current account deficit. So China can act as a source of aggregate demand. It is turning from a producer to a consumer. You need a strong Chinese economy to sustain the global economy. Youngkin says the slowing of China’s growth is impacting the world. We get back to where we started. Reengineering supply chains away from China is just not realistic. Both countries absolutely need success globally. We are going to be mutually dependent. John Zhao says we invested in Hollywood studios. I just don’t know how you could reverse that trade, it’s about human demand. You’re going to see more financial service companies coming into China, they will influence the rule making. Adams says we need to move the conversation and the institutions such as the WTO to the role of data. John Zhao says the (state-owned enterprise) SOE investment story, when we started 15 years ago, a lot of SOEs were in big trouble. They didn’t have access to capital. That was the part of Chinese economy that is the largest base, if you don’t move that you don’t move the Chinese economy. Today we’re at SOE restructuring 3.0, where we sell back some of the share that we own to a large SOE because there are other resources for them. He says Chinese companies, we always knew there is going to be a great set of SOEs. The purpose is not to get rid of them, it’s to make them more productive. Jin Keyu says with tech there is real potential for head-on-head competition. Youngkin says political circumstance in the US is unified on this topic (of IP protection for tech). If there is not some sort of agreement to pay attention to tech advancement, whether it is state-supported or protected in some way. The US is unified and policies will be enacted to put even higher protective mechanisms around tech. John Zhao says it is not all facts-based. What that unification has assumed is wrong about the Chinese government in every way. I’ve seen more misunderstanding based on the old way of thinking. They think China will become more and more like us. China on the other hand was benefitting from global trade, seeing their lives being better, they are gaining financial power, thinking now we get to be respected. Fang Xinghai says China needs IP protection itself because it is becoming better at tech. He says if the US’ motivation in this regard is more sinister, that is going to fail. China will try to innovate even harder. Tech people are not afraid, he says. Technological innovation in today’s world is not that difficult. Jin Keyu says it’s too late, if the US wants to limit China’s growth, it’s too late. John Zhao says with the trade war, we are at the darkest moment before the dawn. I don’t know why anybody wanted to limit 1. 4 billion people’s pursuit of happiness.